Twenty days prior to the Easter Rising, the Chancellor of the Exchequer in London, Mr. Reginald McKenna, presented his Budget for 1916-17. The Budget was one of a series of World War I budgets, and it precipitated further tax increases to fund the war. Government expenditure in Ireland between 1911 and 1914 exceeded revenue by between two and thirteen percent. In the financial year 1912-13, a deficit of £1.4m was recorded. In 1915-16 and 1916-17 substantial tax increases were directed towards funding WWI. In 1915-16, a surplus of £5.3m was recorded but expenditure was only 70% of the total revenue. 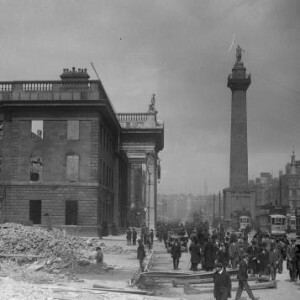 In 1916-17, the surplus doubled to £11.1m and just over half of the revenue (53%) was spent in Ireland, while 47% was available to the British government for other purposes. Figure 1 and table 1 below shows spending in the early years of the 20th Century. (Source: Oldham, 19201 ) *Figures refer to the island of Ireland. A tax on sugary drinks was announced in Budget 2016 by the Chancellor of the Exchequer. A similar sugar levy existed in 1916; however, the purpose of the levy was very different. The 1916 levy was a tax to increase revenue to fund WWI, while the 2016 sugar tax (to be introduced by 2018) is posited as a tax on sugary drinks to counteract health problems such as obesity and diabetes. The sugar tax increase in 1916-17 was projected to raise £7m. The 1916-17 Budget (hereafter ‘the Budget’), introduced many additional taxes as well as increasing those already in existence. The total war indebtedness in April 1916 was estimated to be £2.1 billion. The revenue estimate for 1916-17 was £426m, rising to £502m with the new taxation measures expected to yield £76m. Table 2 lists key direct and indirect taxes in the Budget. Income tax was increased to 25% to yield £43.5m in additional revenue. The exemption limit for income taxes was lowered. The sugar tax was increased to half a penny a pound. The rate of duty on excess profits increased from 50% to 60% in the Budget to yield a total of £86m.